To store a number, I am using another instance of WebClient, with a base URL set. 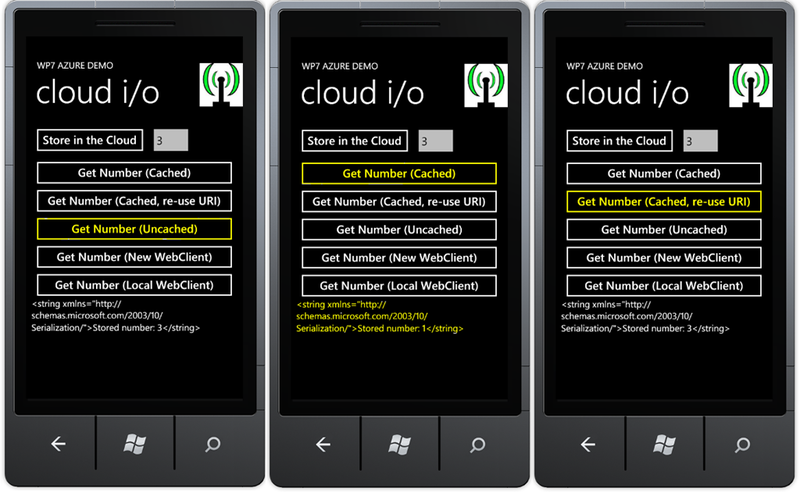 This same instance can also be used to retrieve the number from the service, so my application has the possibility to retrieve a single number from an Azure hosted web service in different ways. While testing the application, I started by retrieving the number that is currently stored in my Azure service, followed by storing a new number in the cloud and again retrieving the number that is currently stored. As you can see in the following screen dump, the last retrieval came with an unexpected result (1 instead of 3). Where did my stored number go? It turns out that the WebClient is caching data, and it appears it does so to the extreme. Even if I create a new WebClient, it still uses cached data which is a complete surprise to me. On one hand this seems like a good thing, because it will result in less calls being made to the cloud, thus saving valuable resources. At the same time, it seems like a bad thing. What if my cloud data is updated and I still want to retrieve it through a REST call? Especially when creating a new WebClient object I think it would be reasonable to assume that a ‘real’ call will be made to my Azure service. To resolve this potential issue, there is an easy solution. Just decorate the REST call with a unique string. Of course I don’t want to do this always, since that means that I am always physically calling out to the service. By re-using the last decorated REST call until I want to force a refresh of my data, I kind of have the best of both worlds available. Retrieving the data from the service without caching gives the expected result. Be aware though that the original cached data is still stored, so retrieving cached afterwards again gives us the original (cached) value. 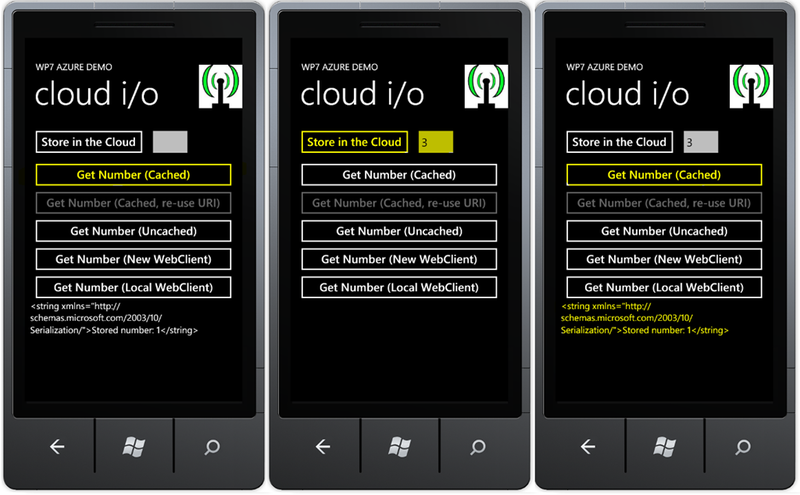 This explanation ofthe WebClient caching behavior will hopefully help you creating better Windows Phone 7 applications and save you time trying to understand what is going on behind the scenes. A great way to blog on the road with my brand new Windows Phone 7 (a Samsung Omnia 7). No more excuses to not blog on the road.